Not many people scan more than the first few pages, so probably 99% of the content isn't discovered here. Your post is only exposed for a very short period of time. Less people view posts in "hot" than in "trending". To actually get decent exposure here you need to already be relatively popular or be extremely lucky. Only already extremely well earning content is shown here. This time you can actually influence the amount of exposure directly. The more you pay, the higher the exposure! A lot less people browse in actual tags. Potential exposure to 1000's and 1000's of users "for free"! If your followers resteem something, your exposure increases exponentially! It does take months and months to build up followers though (and a little bit of luck). Having a lot of followers is the absolute best way to be a successful author on SteemIt and if you work hard you can eventually even make a living out of it! Next time you find content worth upvoting, make it your absolute highest priority to check out the blog history of the author (if you aren't following the author yet). If the blog history is interesting to you, give them the well deserved follow! Browsing their blog history gives you potential entertainment and/or education you otherwise never would have experienced just upvoting posts. The content that is out there is much, much more interesting than the curation rewards, which are almost nil anyway. You both benefit more from a follow than an upvote. Don't forget to follow, resteem and browse my channel for more information! An excellent post and great advice. I'll definitely resteem. We need to find more ways that authors can gain exposure. Maybe with Facebook style groups in which you can resteem content. For sure. I thought resteeming already generated curation rewards. Is that not the case? Hmm i don't know. But you bring up a good point about the rewards for resteeming. Maybe you should earn rewards based on your followers. 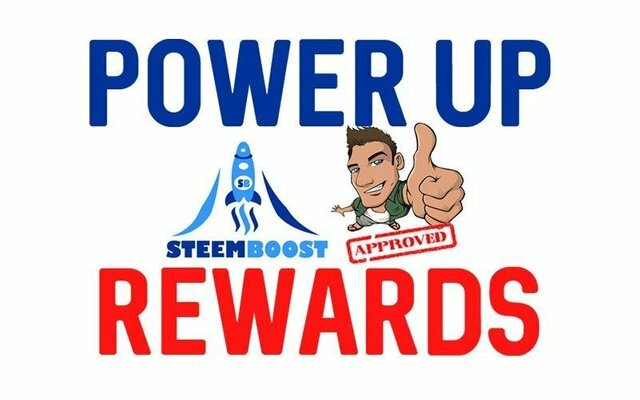 They could make the algorithm as hard as you want to include the activity of your followers, the average reputation, their average and/or combined STEEM POWER and such. Just checked this post (https://steemit.com/steem-help/@stealthtrader/what-is-resteem-and-how-does-it-work) suggesting that resteeming doesn't give curation rewards directly but if you previously upvoted the post then it may help increase the total post and thus curation reward. Your idea for a resteeming curation reward algorithm sounds on point - I would vote for that. 100 % agree. that's why I try to follow anyone who I upvote, in case I miss great content. Follow for follow at least please everyone. Currently following 8193 and followers count is 562 that's a good start I think. Very informative post. Thank you for posting this. It's going to be very helpful for me, as a noob. 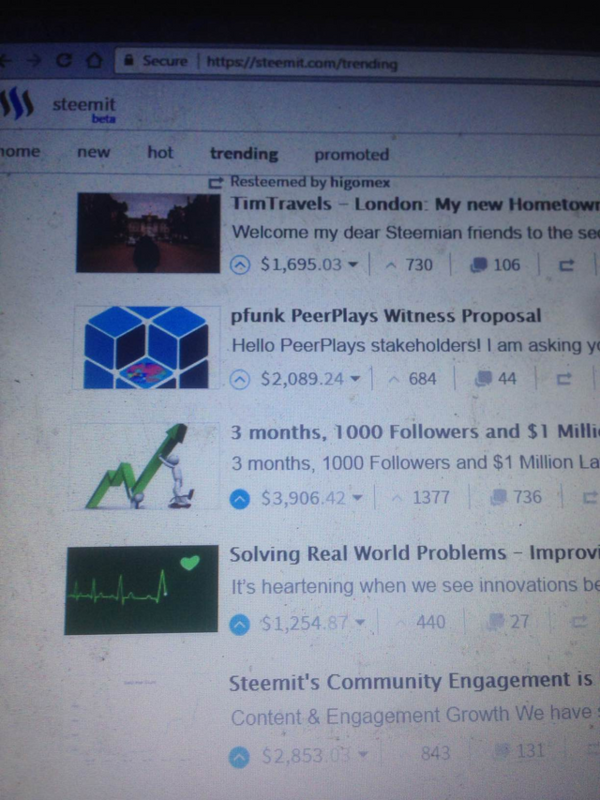 Steemit has a great thing going. I really like the supportive community. Thank you again. Very great stuff here and I think it will be useful for others new to the tactics to get more exposure. I'm not sure about your title LOL, @calamus056! You have just got my follow. Ah k, thanks for the follow (and vote? haha). This post has been ranked within the top 50 most undervalued posts in the second half of May 29. We estimate that this post is undervalued by $20.11 as compared to a scenario in which every voter had an equal say. See the full rankings and details in The Daily Tribune: May 29 - Part II. You can also read about some of our methodology, data analysis and technical details in our initial post. Unvoted and resteemed. I wonder if we can get this post to the feed! I hope you mean upvoted haha. Thanks for the tips @calamus056. Thanks for this. I was starting to get disillusioned after watching my own posts do absolutely nothing. This makes it all a bit clearer from my novice position. onward and forward! as they say. Good info. Followed and upvoted. I like how you break them all down, it all makes sense but is it based on any real data or you just guessing? I don't care because what you say is helping me already but I was just curious. naw...I don't agree with most of it. Interesting, can you give some examples? at one time I had over 1400 that I was following. most of what came thru my home feed was uninteresting. SO...I've been purging. I'm 'unfollowing' anyone and everyone that I haven't interacted with personally and/or have some compelling reason to be interested in what they have to say. I expect I'll stop the purge at around fifty. HOME...I don't let strangers into my home.. I'm at 800 ish...now...the quality of my homefeed has improved immensely..
That has nothing to do with this post. This post is about exposure of YOUR posts. the title of the post is " You aren't following and resteeming enough people! that's just what I talked about. and I consider most 'resteem' to be spam...I wish I could block it all. "nothing I can do about that. I'm certainly not going to PAY (for the promoted tab)...I never lookit it anyway. are you a marketing geek? See my latest post for details. if people want to follow me.that's up to them. so you ARE a marketing geek. do you feel that is moral? I took a course in marketing when in college...they admitted to teaching how to be deceptive. I'm a programmer. But once again i have no idea what you're talking about. You keep going off topic. EDIT: oh wait you edited your posts. Lemme read up. I find some that use very little of their voting power. There is no sense in letting it go to waste. Resteeming is fine, but i don't like to follow people who only resteem. Contribute something original, then we're talking. Thanks again for the good analysis. It was good to see your assessment of the different categories. It makes sense that the greatest market exposure would come from direct followers. Oh so I'm different again. Thanks for all the help, we need it. Great post and advice. Thanks for the info. 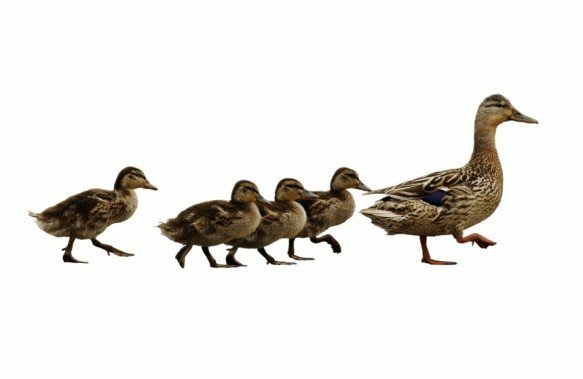 Upvote, resteemed and followed. So does that mean I should follow you? Haha..
Its a grind for sure.. If only this post could somehow remain sticky! But we do need favorites or something for sure. I made a concept once: SteemIt collections. ###Also upvoting is important. People should upvote more! We are continuing our power up rewarding series! People should only upvote undervalued posts more, they should stop upvoting posts of popular authors so massively, not every post they make deserves $500! Maybe you would follow me as well? Very good advice. Much appreciated. Followed. New follower here thank you for the info. Take care. yes I always follow back on instagram and it has earned me 2000 followers in two years but I have gotten a few hundred steemit followers alot faster than instaram and now i have my big instagram account to begin blasing ot steemit posts! That one got me alot of likes a new followers on instagram! II just posted this anit should really get some attentioN! 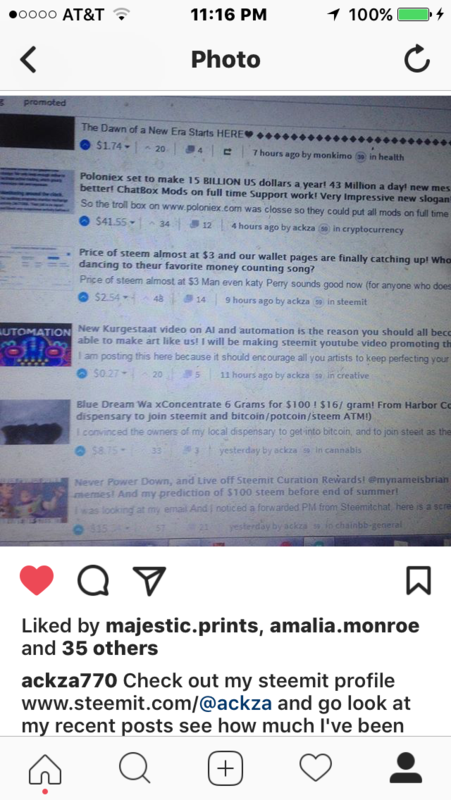 post this image to your instagram and show people how they can make thousands per post everyday! I appreciate you taking the time to write this. Many authors here, including myself, are always looking at ways to increase exposure, and, being a technical guy, your breakdown and explanation are great. Upvoted, and resteemed. Thanks, i still need to improve a lot though. I'm trying to keep things as simple as possible usually so everyone can understand it. We all have room for improvement. That is the nature of growth. Keep up the good work! The thing is though, i don't want to spend 50 hours on 1 article to make it absolutely perfect when 2 hours will do the job more than fine. I do analysis on digital asset prices. They usually take me 2-3 hours to do a good job. No need to be perfect. Better to get the info out. I saw you did a BTC analysis, you might want to check out my technical analysis of BTC since 2009.